﻿First-year dental students Alexander DeGenova and Katelyn Kirkpatrick have recently founded the LSUSD chapter of the Student Professionalism and Ethics Association in Dentistry (SPEA). Begun in 2007 by a small group of dental students at the University of Southern California who wanted to become more active in promoting ethics at their school, SPEA became a national organization in 2011. It has received support from the American Student Dental Association, American Dental Association, American College of Dentists (ACD) and American Society of Dental Ethics. Over fifty dental schools throughout the country now have SPEA chapters. 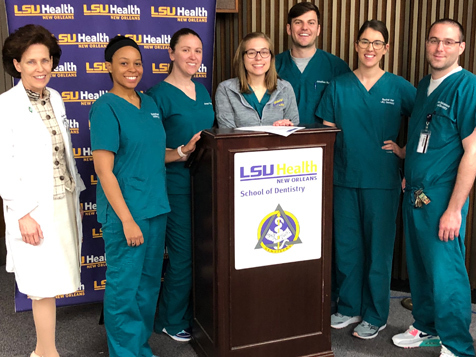 The first LSUSD chapter meeting, held on February 18, was attended by twenty first- and second-year dental students. Dr. Erik Klintmalm, a national SPEA representative, spoke on accepting responsibility, developing leadership, and making right choices in patient care. Dr. Klintmalm is SPEA vice-president of membership affairs and an intern on the board of the ACD. The SPEA chapter plans to meet monthly, presenting lectures on ethics and professionalism by local members of the ACD. Dr. Robert Barsley, professor of diagnostic sciences, is the SPEA on-campus faculty advisor and Dr. Kristi Soileau, president-elect of the Louisiana section of ACD, serves as off-campus advisor. The 9th annual session of SPEA will be held in San Francisco on September 6-7, 2019. ﻿Dental care to underserved children in Louisiana recently received significant support through a grant from the Blue Cross Blue Shield of Louisiana Foundation (BCBSLAF). 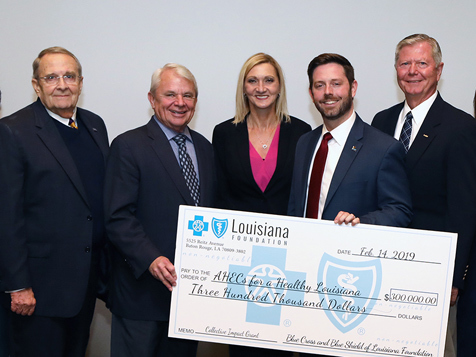 LSUSD will be a participant in the school-based program funded with $300,000 from BCBSLAF and administered by Area Health Education Centers (AHEC) across the state. The grant will provide free dental screenings, sealants, and fluoride varnish treatments as well as primary health care education to 3,600 children in underserved rural areas. Gayla Strahan at the Southeast Louisiana Area Health Education Center is project director. ﻿Nominations are being accepted for two award:s Alumnus of the Year and Distinguished Alumnus. The Alumnus of the Year Award (est. 1998) is the highest honor bestowed by the school. The hallmark of each recipient is a distinctive career of lifetime achievement as well as a commitment to strengthen LSUSD through volunteerism and financial support. The Distinguished Alumnus Award (est. 2014) recognizes a graduate who has shown extraordinary lifetime professional achievement in the areas of dental education, research, or community service. The award honors those who have made significant contributions to the profession of dentistry. The deadline for nominations is July 31, 2019. Recipients will be honored at Alumni Day on Friday, September 20, 2019. For more information visit the LSUSD website at www.lsusd.lsuhsc.edu/Alumni/AlumYear.html.